I don’t know if I’ve confessed this to you, blog, or if I’ve just not confessed it lately, but in the vast world of knitting skills, one thing I have still not been able to drill down into my neurons is Kitchener stitch. It’s just one of those things. After only a decade of consistent knitting I’ve finally gotten to a point where I just need a reminder of how to start it and then I can merrily Kitchener along no problem, but I still always need to look it up first. Last winter I had a bit of a breakthrough when I had 2 projects in the space of a week that needed Kitchenering – the tops of a pair of mittens, and the under-arms of a seamless sweater. (If this is a brand new technique for you, the short description is that it’s a way of sewing together 2 rows of live stitches into a seamless fabric). That went a long way to sealing in the knowledge. I suppose it’s fair that if you don’t use a technique on every project, you’re going to learn it more slowly. One of the popular spots to use Kitchener stitch is in the final toe seam of top-down socks with a wedge toe. For the longest time when I was new to sock knitting I just avoided Kitchenering altogether, so I just did a mattress stitch horizontal seam instead, because I knew how to do that. After 10 or so years of sock knitting, I still do this. I bind off all the stitches, leave a long tail, and then come back later (sometimes days or weeks later), and sew up the toe. Case in point, these socks have been finished for 2 weeks but I still hadn’t finished them, so today I finally decided they were getting done. My shortcut solution, it turns out, still involves a lot of procrastination, but don’t worry, I reassured my current seamless sweater that its under-arm seams are still going to get the Kitchener stitch treatment. I can evolve slowly. There’s usually more than one way to do something in knitting, thank goodness. I never use the Kitchener. I do the 3 needle bind-off for all my socks and anything else that’s appropriate. I’ve never had the sock toe bulge or come apart. Took me awhile to get it but now I can actually do it without instructions right In front of me. lol. And I love how it looks. You know, I have a sock that needs a toe that I think I finished when I was up your way in February! Sigh. It really will only take 10 minutes. I just remember that I go through each stitch twice. The first time it is the opposite of how it presents, the second the same way. Then it comes off. This would look something like purl through the first stitch on the front, knit though first stitch on back. Then come back and knit through front and take off, purl through next front, purl through back stitch and off, knit through next back. Rinse and repeat. Because I remember what I am trying to achieve, I don’t need to remember the pattern for each step. Take a look at Techknitting.blogspot.com. Look up grafting in the index. She has figured out a way to do it with knitting needles. You’re really going through the same process as with grafting with a sewing needle but it sure seems a lot easier. Same here! I have been knitting seriously since I was ten, so that’s over 30 years, and I still am stumped by this dumb kitchener stitch. I mis-spell it most of the time, too. Repeat c. and d. only till end. Same off means enter knit st k-wise and pull st off needle, or enter purl st p-wise and pull off needle. Steps a. and b. are the setup and involve one st from each needle. After that, steps c. and d. always involve pulling one st off and entering the next st.
Remembering the formula in terms of ‘opposite’ and ‘same’ makes it easy to graft knit-purl patterns. Also remember that ‘opposite’ and ‘same’ refer to how they appear to you — you will be looking at the RS of one piece and WS of the other. Sounds like a common problem! I had the same experience of needing to look it up every time. Then I started knitting socks from the toe up, according to Melissa Morgan-Oaks book. That’s my preferred method now and it leaves a seamless toe. It somehow makes me feel better that even you have to do a refresh with Kitchener. I always have to You Tube before a fresh start. Just to double check. Years ago I had a class from the much missed (at least she should be) Sidna Farley. The class was on knitting a top down sweater, but we knit it in a variety of directions, partly to learn and partly because it made sense. As part of this class, she taught us to graft stitches not only in stockinette (the Kitchener stitch), but in purl, garter, and stitch patterns. It didn’t take as much practice as I expected to master grafting — a large part of it is being able to read your knitting and then inserting your sewing yarn in such a way as to create the type of stitch you want. I always have to check as well!! But I love how it looks, as I don’t like having seams on my toes… More comfy too. I’ve never had problems with Kitchenering..but I’m wondering if your bindoff/matress stitching method wouldn’t sort of reenforce the toe and give those socks longer life? HMMMMMM. Something to think about! My Kitchener lifesaver is http://nelkindesigns.blogspot.ca/2010/08/zen-of-kitchener-stitch.html. I copied the simple chart onto my ipad and use it every time. I’m not sure why, but I tried it once and have never forgotten it, whereas before I had to read the instructions every time. It’s magic, I think! It’s fascinating how different brains work differently isn’t it? I fully admit that I cannot do most of the awesome knitterly things you do. However, I got Kitchener on the first try and can easily fly along with it every time. There are so many people who seem to have so much trouble with kitchener that I was totally nervous to try it, but I turned out to be one of the lucky ones, I guess, for whom it just clicked right away. As yvette above me says, it really is fascinating the things that stick for certain people, and the things that don’t. My own personal demon issue is that, despite almost 30 years of dance training, I cannot learn a polka to save my life (fortunately, it doesn’t come up nearly as often as kitchener stitch does). 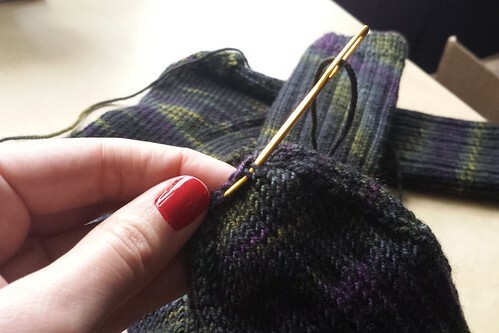 My first sock was a round toe – after that my mom taught me how to Kitchener and I haven’t looked back – I’ve even used it on projects that don’t call for it (like instead of a three needle bind-off). Once it clicks – it sticks! I really learned it when I was creating my own pattern and had to figure out how to seamlessly two ends that were checkerboard pattern so the pattern didn’t look interrupted. I learned a lot about watching how the stitch is presented and how to continue that appearance. When I knit my first sock my daughter gave me a little booklet that has a Kitchener mantra in it that sticks in my head to this day. “Knit off, purl on; purl off, knit on.” Basically you stick your needle into the first, front needle stitch as if to knit, pop it off, then through the second, front needle stitch as if to purl and leave it on. Then you stick your needle into the first, back needle stitch as if to purl, pop it off, then through the second, back needle stitch as if to knit and leave it on. “Knit off, purl on; purl off, knit on.” If you ever see my lips moving when I’m Kitchenering a sock toe, that’s what I’m saying. And I look for shawl patterns that have you cast on a few hundred stitches and then get smaller. It’s a pain casting on that many but every row gets easier and faster. It’s the only way to manage my knitter’s ADD. Beautiful shawl, Karen, gorgeous colors. Your grandmother will love it. Sorry, you’re not Karen, are you, and you’re not sending a shawl to your granny. I plead Monday. Same here. I always have to refer to a book. I have been working headbands and have been using the 3 needle bind off but I think I will try the kitchener on one and see which I like best. Thanks for the bright idea! I’m a Kitchener fan, though I wasn’t always. When I first learned it, it was presented as eight different steps (which is more that the average human can remember. 3-7 is the range). I couldn’t really read where I was, so I would be six stitches along before I saw a mistake and if I got interrupted, I would usually have to pull it out and start over. One day, I sat with the instructions willing myself to see a pattern that would let me group the beast into chunks that made sense. Now I think about working the stitches in pairs (work a pair on the front, work a pair on the back). In stockinette, the front side is knit, so on the front needle enter the first of the pair as if to knit and enter the second the opposite way. On the back needle, because the backside of stockinette is purl, enter the first of the pair as if to purl and the second the opposite way. The first stitch of a pair is always dropped off after it is worked, and the setup begins in the middle of a pair. For me, this grouping was magic! I was like a kid who suddenly grasps that letters group together to form words. A whole new, exciting world opened up and I fell in love with the Kitchener stitch. Having made countless pairs of socks I can Kitchener in my sleep – as long as it’s on stocking stitch – however I have a pattern for sideways, garter stitch mitts, that have to be grafted – so much concentration needed to kitchener for garter stitch vs stocking stitch. Even one word from someone else leaves me confused – not fun. Although the fingerless mitts are wonderful, I call them a hug for your hands. Hi there! I am brand new to sock knitting and the Kitchener stitch but I can recommend a video on it that makes it so simple! Its on Susan Andersons blog at http://susananderson.blogspot.ca She makes it look very simple..love it! I hand lettered the instructions for Kitchener Stitch on a plain white mug with permanent marker. So now everytime I need to Kitchener something, I make a cup of tea with the mug and it makes the whole process more relaxing.